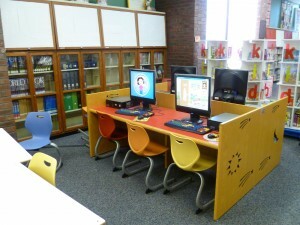 There are two different computer areas in the Children's Library. One computer area has six computers with internet access and Microsoft Office programs. These six computers require a library card to sign on and can be used by children age twelve and under. Computer use on Children's Library computers is limited to 2 hours per day. Two of the six computers in this area have been designated as Family Computers. Family Computers require a library card to sign on and can be used by an adult, only when they are accompanied by, and supervising, a child. Computer use on Family Computers is limited to 30 minutes per day. There are six other Early Literacy Stations (ELS) with computer games for children ages 2-10 years old. The Early Literacy Station (ELS) is dynamic all-in-one digital learning resource. Each computer is pre-programmed with over 50 educational and fun games. Click here for the list of pre-programmed ELS games. Some of these computers have touchscreen capabilities. Library cards are not needed to sign-on to these computers.